Explore the fascinating world of natural colors. Experiment with different flowers, fruits, and vegetables (like black grapes, dried fruits of amla/gooseberry), leaves (eucalyptus), plants (arandi/castor). Encourage the use of eco-friendly natural colors and motivate our friends to do so. 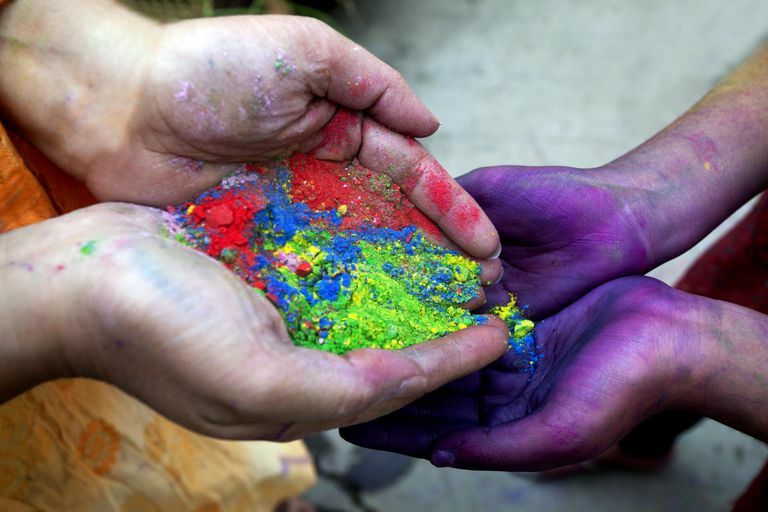 Most Holi colors sold in the market are oxidized metals or industrial dyes mixed with engine oil. Sample this: Green comes from copper sulfate, purple is chromium iodide, silver is aluminum bromide, black is lead oxide and shiny colors are the result of powdered glass being added to the colors. All these are toxic and can result in anything from skin allergies, eye irritation, blindness and much more. When washed, they enter the rivers and the soil and increase pollution. By using safe, natural colors we not only save our skins but also help save our environment and conserve our biodiversity. When these colors percolate into the soil and water they do not add toxicity to our blue planet and cause no harm to the myriad life forms that live in the soil and water. 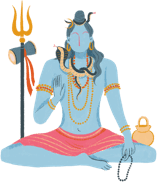 Thereby, we also popularize the diverse plants and trees that give us these colors, and live life the Vedic way, our ancient and most precious heritage. Here are all the recipes that'll make your Holi naturally colorful. Learn how to get reds, greens, blues, saffrons, yellows, and magentas from fruits, vegetables, flowers, and cereals, all at home. Dry: Red sandalwood powder/Raktachandan/Lalchandan (Pterocarpus santalinus) has a beautiful red color, which is beneficial for the skin and is used for face packs, etc. This can be used instead of red gulal. Dry red hibiscus flowers in the shade and powder it to make a lovely red color. To increase the bulk add any flour to it, in proportion to the vibrancy of the color you want to obtain. Sinduria (Annato) has a water chestnut shaped fruit, which contains lovely brick color red seeds. These yield both dry and wet colors. Wet: Put two teaspoons of red sandalwood powder in five liters of water and boil. Dilute with 20 liters of water. Peels of Red Pomegranate boiled in water give red. Mix a pinch of lime powder (the one that we eat with our paan/betel leaves) in half a cup of water and add 2 tablespoons of haldi (turmeric) powder in it. Mix it thoroughly. Use only after diluting with 10 liters of water. Buras (Rhododentron arboreum) known as Burans in the Garhwal hills and Brand in the Kumaon hills of India gives a lovely red color when soaked in water overnight. The Palita Madar / Pangri / Indian Coral tree (Erythrina indica), found commonly in coastal regions, has large red flowers. Soak the flowers in water overnight. Boil wood of Madder Tree in water for a deep red. Red color can also be obtained from the juice of tomatoes and carrots. This can be diluted with sufficient quantity of water to remove the stickiness. Dry: Use Mehendi/henna powder (not mixed with amla) separately or mix with equal quantity of any flour to attain a lovely green shade. Dry Mehendi will not leave color on your face as it can be easily brushed off. Only Mehendi mixed in water might leave a slight color on your face. Many people like smearing other person's hair with colors. How about doing it with Mehendi powder and saving a trip to the parlor? Dry and finely powder the leaves of Gulmohur tree for a green. Crush the tender leaves of the Wheat plant to obtain a natural safe green Holi color. Wet: Mix two teaspoons of mehendi in one litre of water. Stir well. Green color can also be obtained by mixing a fine paste of leaves like spinach/palak, coriander / dhaniya, mint / pudina, etc. in water. Wet: Slice or grate one beetroot. Soak in 1 liter of water for a wonderful magenta. Leave overnight for a deeper shade. Dilute with water. Boil the peels of 10-15 onions in a half liter of water for an orangish-pink color. Remove the peels before using to remove the smell. Wet: The Flame of the Forest (Butea monosperma), known as Tesu, Palash or Dhak in Indian languages, is the source of the wonderful, traditional color for Holi. The flowers are soaked overnight in water and can also be boiled to obtain a fragrant yellowish-orange colored water. Legends say Lord Krishna used to play Holi with Tesu flowers, which also have some medicinal properties. Boil flowers petals of Semul / Silk Cotton, a red variety of Bombax ceiba) in water. Both Tesu and Semul bloom during February-March. Collect and dry the stalks of Harashringar / Parijatak (Nyctanthes arbontristis) flowers during the early winter season. Soak them in water to get a pleasant orange color. Mix a pinch of sandalwood powder in 1 liter of water for an instant, beautiful and fragrant saffron color. Soak a few stalks of saffron / Kesar in 2 tablespoons of water. Leave for few hours and grind to make a fine paste. Dilute with water for desired color strength. Though expensive, it is excellent for the skin. Dry: Mix two teaspoons of haldi/turmeric powder with double the quantity of besan (gram flour). Haldi and besan are extremely healthy for our skin, and are also used widely as an ubtan while taking bath. You can use the ordinary haldi or "kasturi" haldi which is very fragrant and has enhanced therapeutic effects. Besan can be substituted by wheat/rice/arrowroot flour or talcum powder. Flowers like Amaltas (Cassia fistula), Marigold/Gainda (Tagetus erecta), and Yellow Chrysanthemums yield different shades of yellow. Dry the petals of these flowers in shade and crush them to obtain a fine powder. Take an appropriate quantity of the powder and mix it with besan or use separately. Dry the rind of the Bael fruit (Aegle marmelos) and grind to obtain a yellow colored powder. Wet: Add one teaspoon of haldi to two liters of water and stir well. This can be boiled to increase the concentration of color and further diluted. Soak 50 marigold flowers in 2 liters of water. Boil and leave overnight. Dry: Jacaranda flowers can be dried in the shade and ground to obtain a beautiful blue powder. The flowers bloom in summers. The blue Hibiscus (found in Kerala) can be dried and powdered. Wet: Crush berries of the Indigo tree and add to water for desired color strength. In some Indigo species the leaves when boiled in water yield a rich blue.